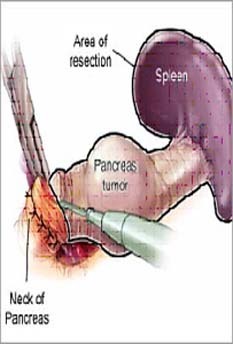 Pancreatic Cancertreatment and surgery India offers information on Pancreatic CancerDoctor India, Pancreatic Cancertreatment and surgery Hospital India, Pancreatic Cancertreatment and surgery Abroad, Pancreatic Cancercauses, symptoms, Risk factors, treatment and surgery. 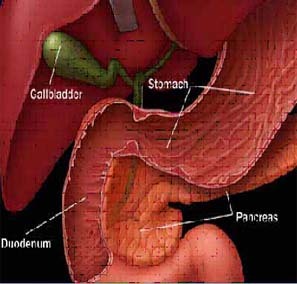 Pancreatic cancer is one of the most serious of cancers. It develops when cancerous cells form in the tissues of your pancreas — a large organ that lies horizontally behind the lower part of your stomach. 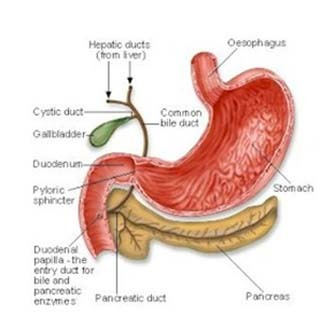 Your pancreas secretes enzymes that aid digestion and hormones that help regulate the metabolism of carbohydrates. For years, little was known about pancreatic cancer. But researchers are beginning to understand the genetic basis of the disease — knowledge that may eventually lead to new and better treatments. Just as important, you may be able to reduce your risk of pancreatic cancer with some lifestyle changes. Age : The risk of this cancer goes up with age. Almost 90% of patients are older than 55. The average age at the time the cancer is found is 72. Gender : Men have this cancer slightly more often than women. Race : African Americans are more likely to have this cancer than are whites. Obesity and Lack of Exercise : Very overweight people are more likely to develop pancreatic cancer, as are those who don't get much exercise. Chronic Pancreatitis : This is a long-term inflammation of the pancreas. It is linked with a slightly higher risk of pancreatic cancer, but most people with this condition do not get pancreatic cancer. Work Exposure : Heavy exposure at work to certain substances (pesticides, dyes, and chemicals) may increase the risk of getting cancer of the pancreas. Family History : Cancer of the pancreas seems to run in some families. This may account for about 1 in 10 cases. Changes in DNA that increase the risk for certain other cancers also increase the risk of this cancer. Stomach Problems : Having too much stomach acid or having a bacteria called H. pylori in the stomach may increase the risk of pancreatic cancer. Smoking : The risk of getting cancer of the pancreas is 2 to 3 times higher among smokers. About 3 out of 10 cases of pancreatic cancer are thought to be caused by smoking. Diet : There may be a link between pancreatic cancer and high-fat diets that include a lot of red meat and pork, especially processed meat (such as sausage and bacon). Some studies have found that diets high in fruits and vegetables may help reduce the risk of pancreatic cancer. But not all studies have found such links, and the exact role of diet in pancreatic cancer is still under study. Jaundice :- If the tumor blocks the bile duct so bile can't flow into the intestines, jaundice may occur, causing the skin and whites of the eyes to turn yellow, the urine to become dark and the stool to turn clay-colored. 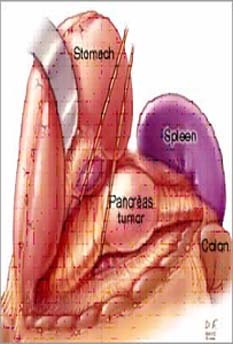 Pain :- As the cancer grows and spreads, pain often develops in the upper abdomen and the back. The pain may increase after a person eats or lies down. 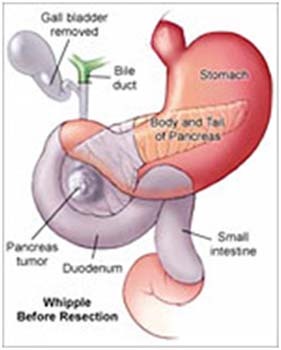 Weight Loss :- Cancer of the pancreas can also cause unintentional weight loss. This is often due to an inadequate intake of calories because of nausea, vomiting and loss of appetite. Digestive Problems :- Digestive problems may occur if the cancer blocks the pancreatic juices from flowing into the intestines, which help the body break down dietary fats, proteins and carbohydrates. Stools may be different than usual and appear pale, bulky or greasy, float in the toilet, or be particularly foul-smelling. Computed tomography (CT) scan : useful for detecting pancreatic masses and checking for metastasized cancer. This procedure is performed infrequently today because lifelong adverse effects may result. 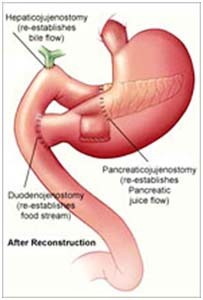 In this surgery, surgeons remove the entire pancreas, bile duct, gallbladder, and spleen, and possibly portions of the small intestine, stomach and nearby lymph.